MP4 file Recovery Software can help you to recover lost deleted formatted Mp4 files from Exfat / Fat32 / NTFS hard drive system or external drive, usb drive. MP4 file Recovery software: Aidfile recovery software can help you recover, restore or retrieve mp4 files lost in hard drive, memory card, SD Cards, hard disk or more other Storage Devices. See this software you can use to recover your lost, deleted, corrupted or formatted MP4 files from Storage Devices, Download Aidfile recovery software to quickly and easily recover deleted formatted MP4 files. Use "Undelete" to recover deleted MP4 files. Use "Unformat" to recover MP4 after format hard drive. Use "Recover partition" to restore MP4 files if partitions changed or damaged or deleted. Use "Full Scan" mode to retrieve deleted MP4 files which can not be found with "undelete" and "unformat" and "recover partition",rescue mp4 from raw partition,recover the mp4 of partitons which are not NTFS,nor exfat,nor fat32. Support deep and full scan lost mp4 from partition , hard drive, usb. completely recover all mp4 from hard drive. Learn more information about data recovery software for MP4 loss. MP4 files loss that we need recover deleted formatted mp4 files . Today, almost every companies are using multimedia format for various devices, they are launching. Mp4 video formats are used by different devices like cameras, PSP, mobile phones, iPod etc. The people are using these devices in an exorbitant way. While using these gadgets they also face different problems related to its functioning for example, it might happen that they are not able to open a particular file, sometimes they suffer from data loss by accidently deleting any important file or deleting any videos. 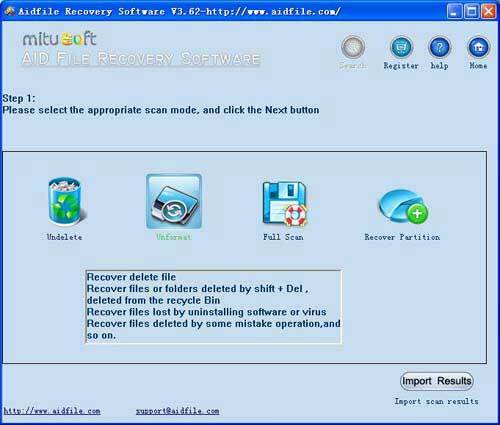 Aidfile Recovery Software is a powerful data recovery tool for rescue files from deleted/formatted/repartition/missing drives/partition table damaged etc. It supports Exfat / FAT32 / NTFS file systems. Aidfile recovery software is a popular mp4 files Recovery tool to recover deleted, formatted, corrupted or lost move music and video from the hard drive disk, memory card and more. It has a wizard interface and allows you to easily recover mp4 files from memory card etc. when you choose aidfile recovery software, use undelete or unformat mode scan hard drive, memory card, SD Cards, hard disk or more other Storage Devices, Following the software wizard, you can quick and easy restore lost deleted or formatted mp4 files. Recover lost, deleted, corrupted and reformatted mp4 files from Storage Devices, Download Aidfile recovery software to easily recover mp4 files. then recovery lost deleted formatted mp4 files now. Videos and audios (MPG, MP4, MP3, MTS, M2TS, 3GP, AVI, MOV, RM, RMVB, etc. ), compressed files (rar, zip, etc. ), PE files (exe, dll, lib, etc.) and so on. How to recover mp4 file ? Select the"Recover Partition " or "unformat" or "undelete" or "full scan" to recover lost mp4 files. MP4, full name of MPEG-4 Part 14, using the MPEG-4 is a multimedia computer file format with the extension. Mp4, to store digital audio and digital video-based. In addition, MP4 MP4 Player can be understood as, MP4 player, is a set of audio, video, picture browsing, e-books, radio is one of the versatile player. It can directly play high quality video, audio, or as a mobile hard disk drive; more products also have some very innovative and useful features, such as Archos AV420 can record video, it will come from DVD, television signals and other equipment MPEG-4 format in the hard disk; for MP4 player can easily connected to the projector and TV output device. From the perspective of personal use, MP4 player, biggest advantage is compact and easy to carry, at any time, portable video.